If I had a Bitcoin every time someone claimed that BPO is "dead" / "hitting the bottom" / "merely staff augmentation that's going away soon", I could commission a whole team of robots to write this blog until the new year. And Accenture's recent decision to drop outsourcing from its tag-line and submerge "BPO" under the broader term "Operations" felt somewhat like a death-knell for the troubled terminology. However, I would argue that BPO is just at the beginning of a much more dynamic phase of its existence and is at least three years' away from the term being put to bed. BPO will evolve into "progressive operations" in time, but as our research illustrates (read on), the BPO market is still immature and has some room to grow before it becomes mainstream. As negative as the connotations of BPO have been in recent years, it has a powerful meaning for businesses today. "Outsourcing" has always signified the transferral of the management of work to a third party, while the broader term "services" just means "work". "They performed services for us" can mean anything, from little projects through to a much larger array of operational delivery. "I outsourced my xxxx to them" means you actually transferred work to the third-party to manage for you on a consistent, ongoing basis. I would also argue that "outsourcing" is appropriate during the early stages of transferring work to a third party. Once that relationship is fully operational and the management of said work already outsourced, then both the client and provider will naturally start calling it something else. Synonymous to this theory is IT. Remember how everyone used the term "ITO" in the late '90s through mid-2000's to describe their sourcing of IT to the EDSes, IBMs and so forth? But today, "ITO" is pretty old-hat - people just call it "IT services", even though so much of it has already been outsourced. Outsourcing was a more appropriate term during those years clients and providers were grappling with all the challenges to make outsourced IT operational and effective. However, once outsourcing had become the norm with how most enterprise clients received a portion of their IT services, it was no longer outsourcing - it merely became the way they ran their IT. It's the same with manufacturing, which has been outsourced longer than anything else, for example, many years ago, Apple outsourced its manufacturing to a Flextronics, but now it's merely how Apple makes its gadgets. On average, close to 40% of IT (apps and infra) is outsourced today. "Outsourcing" of IT is pretty mature - it still clearly has a lot more wiggle room to grow, as close to half of IT is still run from shared services operations, but the level of outsourcing of IT is double that of finance, HR, procurement and supply chain. Until these business process areas surpass at least 30% outsourcing penetration, most firms are still in these early, nascent phases of externalizing the management some of these processes and are hence doing "BPO". BPO isn't the dirty word anymore... it's "operational labor costs"
Cutting to the chase, today's corporations are on an inexorable quest to reduce their reliance on operational staff and align as much of their talent with the "front office" where they interpret data, sell, market or strategize. Noone wants to hire operational staff these days unless they really have to. And BPO is just one of lever of several levers for COOs to pull these days, as this quest gathers steam. So that means many IT/ops staff may be forced out of their firms into manual jobs, or (if they're lucky or smart enough) will shift to the "front office" where they interpret data, sell, market or strategize. And many may opt to ply their trade with BPO providers. The biggest single problem facing the future of the white collar industry is what to do with all these "operational" people as they can't all be reemployed as "value-add staff" - there won't be as many vacancies to fill and many staff simply do not have the skills. In short, we're likely facing an employment crisis of unforeseen proportions, due to the sheer speed of automation and commoditization today - and this will especially affect the mid-career folks who have waited too long to re-skill themselves. In short, providers can call "BPO" whatever they want. In their eyes they are providing managed expertise - and the leaders like Accenture, Capgemini, Genpact, Infosys, HP et al. want more than just the BPO piece of the pie - they want the IT enablement, the end-to-end process... they want the operations to run. And the BPO opportunity is much more than simply taking on a few back end processes at lower cost - it's about freeing up enterprises to focus on areas that are relevant to their growth and competitiveness. The better the providers get at delivering the standard BPO services, the greater the opportunity for them to take a bigger piece of the pie. And this is eventually when BPO will fizzle away as part of a broader operational service that is being provided... but it's not for a few years yet as the data above clearly tells us. But let's not get caught up in terminology - the real issue is how ambitious enterprises are taking a much more mercenary approach to running their operations in today's market - why add staff to support processes that are becoming obsolete? In areas where common standards represent an acceptable level of performance, SaaS will rule - such as payroll, accounting, indirect procurement and so forth. You can buy your SaaS and be done with it. Smart firms "born in the cloud" are not looking to hire operators anymore, unless they absolutely have to. You can run a company off Legal Zoom, Intuit, Google etc with a small number of (or none at all) operators. However, in the areas where enterprises can still gain competitive advantage, namely where there is room for innovation, growth and productivity improvements, this is where companies will need help selling, marketing, strategizing, analyzing, designing etc. It is these people in the "front office" who need to lead the decisions on an operations backbone to support the business, but it's how these operations and their supporting systems are configured to support business usability that really matters. The core questions will be "how can I get the data I need to make this decision" and "how do I find the right supply chain partners to get my products to XYZ quickly" and "how do I find the right channels to promote my product" etc. Their systems need to support answers to business problems, not create more problems (like how do we get the stuff from Salesforce into that new analytics tool we bought and run a profit/loss scenario in the accounts system etc). And the scary part that is coming, is if operational heads can't design these operations and supporting systems effectively, their COO (or whomever) will cut a deal with a partner who can. There will be no room for prisoners any more. So when firms like Accenture drop the term "Outsourcing" and replace it with "Operations" they are really saying "stop trying to fix the little things, just hand it all over to us as you know you can't run them effectively yourself". Excellent insights - as always. I am surprised by the amount of shared services for finance (52%). Do you think this will move into more FAO in the future? Very good insights. I couldn't agree more with the move away from operational labour costs. 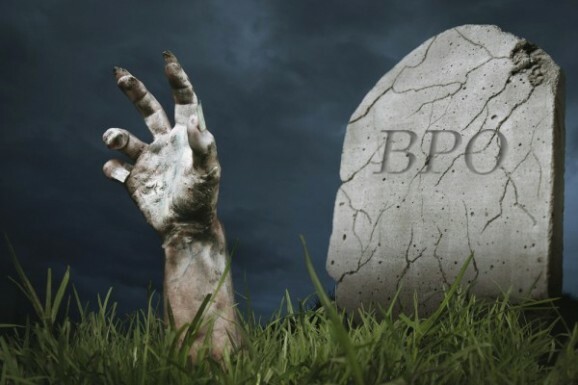 BPO certainly isn't dead yet! "Today’s corporations are on an inexorable quest to reduce their reliance on operational staff and align as much of their talent with the ”front office” where they interpret data, sell, market or strategize"
Classic Phil Fersht. Great stuff! @Jon - thanks for the kind words. In general, there should be more IT and operations in shared services than there currently are - especially when you consider 90% of the global 2000 actually have shared services in place. (Shared services are like George Foreman grills - everyone has them, but don't use them enough). And there are a host of providers desperate to pick up good shared services deals - the problem, is most shared services are not attractive acquisitions for providers - hard to make the numbers work. @Nick - it's a huge worry in general. As platforms for businesses continue to get better and easier to implement, the need to manual operators is on a continual decline. Forget outsourcing, the automation of the enterprise via the Cloud and (eventually) robotics is a genuine to jobs... staff need to be aware of the coming changes and add new skills to their CVs that add value beyond turning widgets. Phil, Do you think that tech-enabled BPO and automation will wipe out offshore staffing? All this talk about the transformation of Outsourcing is all good, but being in a country where its main selling point is labour arbitrage, that transformation may fire back in the long run, unless by that time we manage to evolve (which honestly is a very long shot). @A.R. - there will be a gradual reduction of labor-per-client provided in the future as technology platforms and automation provide more standard solutions for clients (I would estimate this to be 10-30% reduction per client in labor costs over next few years). In addition, even labor-based outsourcing is becoming more efficient and standardized, and less staff will be required proportionately, regardless of technology and automation advancements. On the positive side, 80% of business processes are still inhouse and 60 % of IT for major global enterprises - so while the proportion of staff-per-deal will go down, the number of engagements will continue to proliferate for several years to come. However, the quest to reduce dependence of labor has been in play for many decades - it is nothing new. Talent needs to develop new skills to stay competitive in the marketing place - and this is the same for onshore workers, as well as offshore. We can't all simply stand still and offer exactly the same services - at exactly the same quality - for the next 30 years - we need to continually develop and improve. Indian providers need to develop staff to provide higher level skills, such as data science and process quality acumen, as they evolve their offerings and they also need to look at valuable ways to automate manual processes where possible. The future is scary - but it also has great potential... that's about all we can assume! 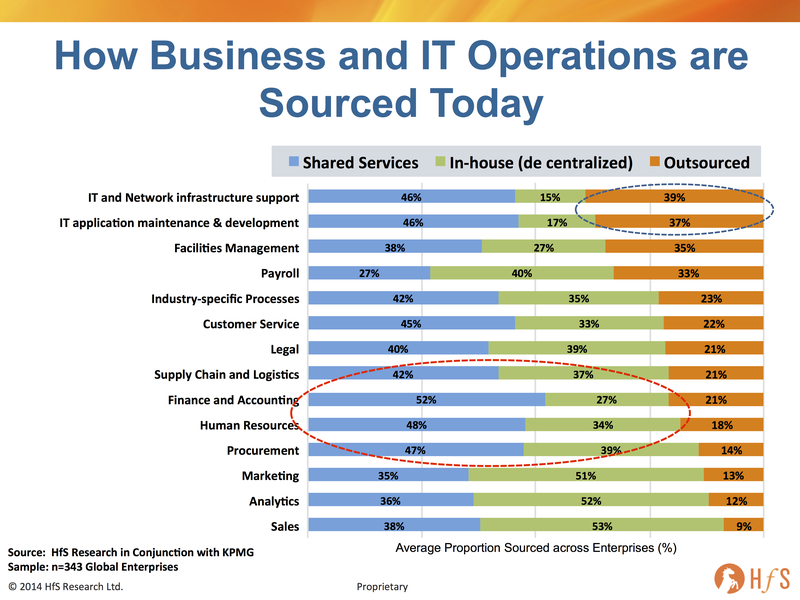 From an operations outsourcing perspective, have seen both trends. On one hand even services sectors that traditionally were uncomfortable sending their operations and backoffice work out have seriously looked at it in recent times - for example, legal firms, media firms, consulting firms. On the other hand, some firms do not still see obvious potential for outsourcing of operations staff/services - they rather prefer to work on the SSO model first and to try and make it work better within their invested centers. The reasons are a varied mix. For some, to do with the pain of transition, risks, upfront costs, ROI. And for some improving G&A costs to best in class - that may not be such a big area of attention (privately held firms for example - nature of investment, exit options etc. etc ). Some are struggling with an organizational strategy driven by M&A which in turn makes this a big turf war later, even if an attractive option to consider. In some cases management buyin is only if the benefits realization is immediate. Other services firms argue about this being an internal process and worry about information security of commercial/client data etc. However, the overriding trend is that there is more potential for BPO and use of technology and SaaS/platforms is of interest, these objections nothwithstanding. BPO is not dead but is popular term for big companies who looking for third party to outsource the work like customer service, back office and IT services. For the small and medium enterprise ,outsource is not popular term for but they are also looking for outsourced company to provide the services for their business growth. It must be just that the slow uptick in orders in recent times may have led to a general view that BPO is no longer on the radar of enterprises. For all the reasons discussed herein and maybe due to the longer decision timeframes in large BPO deals, some disillusionment with limited success in non F&A areas (HRO?) relative to the early days of quick deals and perhaps in the interim period now as more traditional BPO models move to BPM/Process on the cloud, technology driven models...all may contribute to this opinion. What does the recent Genpact quarter result reveal between the lines...interesting to note. Phil – you have covered the IT sector mostly, how do you see the Engineering Consulting business (Civil Infrastructure Design) being affected by the latest outsourcing trends? and is really working or just another fad?